The trouble is, when it comes to romantic comedies, I have a bit of a love-hate relationship. Each time a somewhat promising one comes out, I remember good films I’ve seen in the past (e.g. Love Actually, Friends With Benefits, You’ve Got Mail) and feel like maybe I should go see it… but then I also remember the disappointing moment that inevitably plagues most romcoms, and signals the downward spiral to an ending that always leaves me cringing and trying to wipe the whole experience from my mind. If you’ve ever watched a romantic comedy, you might be familiar with this moment: the film is nearing its conclusion, the guy and gal are about to get together, and there’s a tense, intimate, private scene where they nearly kiss or confess their love. Except they don’t, because they chicken out or somebody interrupts them or some other obstacle is thrown in front of them by the cruel story lord. You feel hard done by, but you don’t mind too much because it is, after all, a romantic comedy, and you know they’re going to get together in the end. Then finally the love confession scene arrives… except this time it’s not a private tense moment. It’s a big, stagey scene in front of a crowd of people who look on while the confession is made over a score of dramatic music. Then the characters hurl themselves at one another and have a showy smooch while everyone cheers. And personally, I always feel a bit hard done by. Not just because everything after this usually gets painfully cheesy, but because I wanted a private, romantic moment for the two characters, not a squirmy public declaration in front of every man and his dog. Obviously not everyone has this response, otherwise the movies wouldn’t all be ending this way. It’s just something I personally can’t stand. To me these scenes are so stagey and fake, and completely devoid of sexual tension. Furthermore, why on earth do all the people watching care? Anyway, my particular dislike of moments like this got me to thinking about fantasy romance novels and movies, both of the paranormal and epic variety. It struck me that stories in these genres don’t usually involve a public declaration of love. If they do, it’s usually not in front of a crowd of smiling strangers. Instead, it’s in a moment of great mortal peril where the people crowding around are either friends sharing in the dire situation, or enemies trying to tear the lovers apart (e.g. 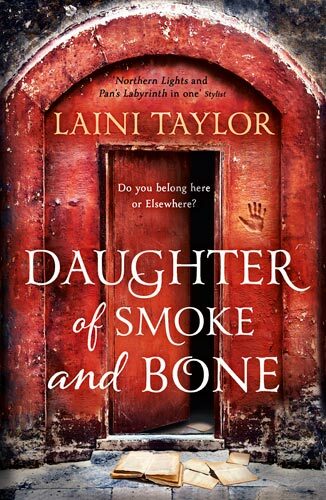 Laini Taylor’s Daughter of Smoke and Bone). So if we all love to see characters declare their love in front of a crowd (except me), why don’t we see this more in fantasy romances? Love in fantasy novels is often secret and forbidden… you’d hardly want to make your illicit affair with a vampire public knowledge. Characters in paranormal romances are often teenagers… and somehow seeing teenagers declare their love in front of a crowd seems even more awkward than seeing adults do it. Fantasy romances tend to operate at a life-and-death level where there’s more at stake than just the relationship. Thus your climactic moment is less likely to involve a hero barging into a wedding right before the words “I do”, and more likely to involve a hero rescuing his beloved before she’s torn apart by demons… or maybe just saving everyone from being torn apart by demons. Maybe (just maybe!) the authors and readers of fantasy romances find public declaration of love scenes just as disappointing as I do…? Though that is probably just wishful thinking on my part. Regardless of the reasons, I’m very glad fantasy books generally spare me the squirm-worthy public declarations of love. It means I enjoy them much more, and don’t have to try and erase the ending from my mind and replace it with a better one, like I do with most romantic comedies. Though I’d say that’s the exception to the rule! So am I alone? Does anyone else hate these scenes? Your mention of Bollywood and melodrama got me thinking! There is an old film by Raj Kapoor – the Indian director/producer who really set down the conventions for Bollywood melodrama and tragic love stories: the movie is called ‘Aah’ (released some time in the 50s). But the movie has two endings (two versions exist). The original version is not so well known and has the hero (Raj) dying of tuberculosis under a tree while he watches his lover (Neelu) getting married to a rather random Doctor fellow. No romantic comedy here! But clearly this version wasn’t going to do well at the box office so a new versions was shot. This time the wedding party with Doctor and Neelu is driving in a car and crashes into the cart in which Raj is coming to attend the wedding. The good Doctor is thus dispensed with, Neelu miraculously survives the car crash and we get quickly spliced to the happy ending in which Raj and Neelu get married under Krishna’s benevolent eye. In Bollywood the final kiss has to be replaced with a wedding for propriety – the random crowd at central station is replaced by an acceptably Indian ending with wedding. I can’t remember if there were camels and elephants. This version might make it onto an airplane for you to watch (under the historic Bollywood channel), but I’m sure the tragic version never will. Interesting that they changed the ending! I seem to remember seeing a few tragic Bollywood romances that had sad endings… or maybe it was just one film that left an impression on me. I remember not liking that tragic ending though so I’m glad there’s a general trend toward happier endings! And I always find the avoidance of the kiss fascinating (and kind of frustrating). My favourite Indian film – Jodha Akbar (an epic historical romance) – is so infuriating at the end because they kind of get close and cuddle but never actually properly kiss! Oh well, at least that romantic scene wasn’t played out in front of a crowd of people, which meant I still preferred it to the standard romcom ending. Not much of a romance reader here, but I know what you mean. The big public declaration seems to be a key moment in such films. Perhaps it’s a kind of “raising the stakes,” that people can talk intimately when they are in private, but speaking in public is much more difficult. You’d seem like such a scumbag if you later left your lover after making the big declaration in front of so many people. Yeah, I guess it probably is a “raising the stakes” thing – a public confession is more difficult for the confessor and makes them more vulnerable. You only need to look at those public proposal catastrophes on YouTube to see how wrong things could go! Love the thoughts on fantasy romance too. Thanks! I haven’t actually seen Fever Pitch – I’ll have to watch it at some point (will brace myself for the public declaration scene at the end). And I completely agree with you about the clapping. I don’t so much mind the big confession itself, but when there’s a crowd and they start clapping and cheering as if the end of the world has just been avoided… it’s so cheesy, and it makes no sense at all! But I guess in romantic-comedy-world it does. Yes, it seems so few people question why this happens, even though it is such a ubiquitous (and in my opinion, strange!) tradition. I watched your video and really enjoyed it – it was fascinating to see all those examples from so many rom coms, including those very early ones. I never realised these public declarations were a modern phenomenon. I also hadn’t thought about the fact they might arise from this need to confirm and approve the relationship in the face of all the comedic craziness – that is intriguing! I suppose that is especially true in those scenes where weddings are interrupted (which is the case for one of those very first scenes that started the trend which you mentioned in your video – the one from Blind Date)… it’s the kind of scenario which could arguably be a very negative moment that upsets the guests and ruins lives, but when everyone starts smiling and clapping it makes it ‘okay’. Anyway, thanks for sharing it – now I also have several new rom coms on my to-watch list, because there were some intriguing ones in your compilation I realised I’d never seen! I would love to know who invented this ridiculous public declaration ending which we have seen one billion times.